Our Spa Retreats are designed to provide you with the ultimate relaxation experience. 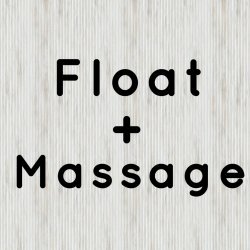 This package includes a Floatation Session (50 min) and a Massage Session (50 min). Bring a friend and make a spa day! Each can choose a package of their choice. While one floats, the other will receive massage/bodywork/sauna session, then switch. Extra Thick Yoga and Pilates Mat 1/2"
Natura TPE Yoga Mat 1/4"